Miraculously lightens your complexion & synergizes with its powerful properties to refine & smoothen skin texture. A moisturing firming mask enriched with Caviar extracts that is rich in advanced nutrients to boost skin’s elasticity. It smoothens, softens, helps reduce fine lines and wrinkles. Skin is firmer, uplifted and brighter. HOW TO USE:1. After cleansing & toning, attach mask on face & fit the curves around eyes, nose & mouth.2. Relax & leave on for 15-20 minutes then discard.3. Gently pat remaining essence into skin. No rinsing required.4. For happy skin & face, follow with CaviarGold Firming Cream.5. For best results, apply mask 2 - 3 times a week. 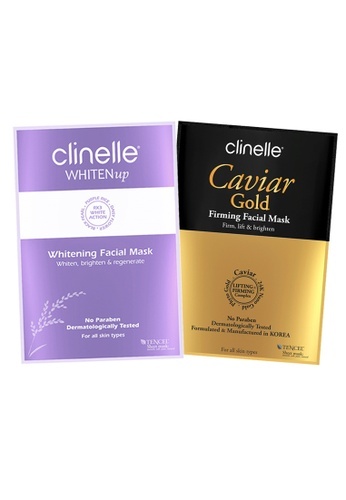 Can't find Skin Care: Clinelle [Official] CaviarGold Firming Mask (1 Sheet) + WhitenUp Whitening Facial Mask (1 Sheet) in your size?